There was a time when pesticides were used to remove worms. Not so today. 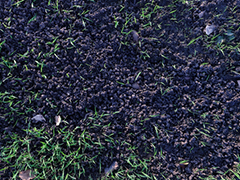 Twenty-seven species of earthworm reside in the UK and under your grass they will be working away, aerating the soil. Charles Darwin referred to worms as ‘nature’s ploughs’ and they’re perfectly designed to create tunnels which allow oxygen and water to enter and carbon dioxide to leave the soil. As they burrow, worms create aerobic bacteria, digested leaf litter and mucus – and if all that leaves you squirmy consider the fact it provides plant roots with rich nutrients. And those worm casts that are such an unsightly nuisance on the lawn contain 1000 times more beneficial bacteria than the original soil. So we need them but don’t feed them. Keep the lawn clear of leaves and other decaying matter and find a dry day to simply brush the worm casts back into the lawn where the fine crumb will be beneficial. Well, soon it will be time to start cutting the lawn again so check you’ve had your garden tractor or mower serviced and ready to go. If you are doing any major turfing projects your need to get them done, in good weather, preferably before the end of the month. Beds intended for seeding can be hoed for weeds and the soil raked over to break it down to a fine surface, but only when it’s dry enough to work. For a family lawn that will endure high use, play and a lot of movement across the grass it’s best to choose a predominantly rye grass or turf mixture which will establish quickly. Thereafter it will need mostly mowing and feeding and if you have a garden tractor with a roller you’ll enjoy fine ‘Wimbledon stripes’ with its darker green colour. As always, keep off the grass if it’s frosty and if dog urine is an issue, due to the dormancy of the grass, pour lots of water on heavily affected areas. Even better if you can do it as soon as possible after the dog has been.